Contents: Language of Light; Dyslexic Children; Finger Computations; Universal Times Table; Merit for Maths; Human Bio-calculator; Digital Compression; See the Digits; Masters of Ancient Knowledge; Artificial Intelligence; Training Manuals; Ancient Puzzles; The Vedic Square; Shadow of a Crystal; Language of Shape; Complementary Pairs; Atomic Structure of Platinum Crystal; Universal Memory Bank; Fixed Design; Books on Magic Squares; Lost Secrets of the Phi Code; Divine Proportion; Fibonacci Numbers; Galactic & Atomic Memory; Grand Secret; The Pentacle; Path of the Planets; Shapes of Sound; The Key to Time Travel; 3-Dimensional View of the Spiral; Compression of the Spiral; Symbol of the Heart; Point of Creation; Principle of Implosion; Mathematics of DNA; Geometry in DNA; Books on Phi; The 5 Elements; Frequencies in Shapes; Pythagoras; The Golden Mean Relationship; Above and Below Unity; Nesting of the Platonic Solids; The Shadow Matrix; 3-Dimensional Pentacle; The Star of David; 4-Dimensional Triangle; Star Tetrahedron; Gender of Geometry; Cosmo-Genesis; Sacred Geometry in DNA. The Divine Proportion, Sacred Geometry. ISBN ……, Length is 2 hours, pub 2006, gms 90. 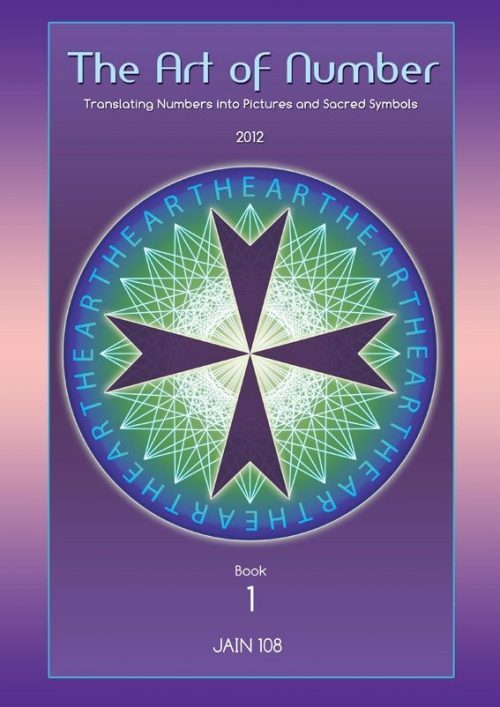 Has Phi Spiral and Magic Square Logo on Front Cover. This is a studio production of a typical 2 hour lecture that Jain gives. 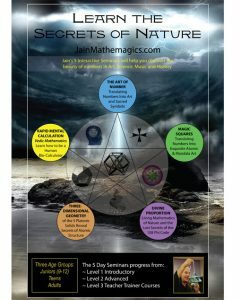 This is an excellent overview of Jain’s broad spectrum of teaching material shared during his world-wide lectures. 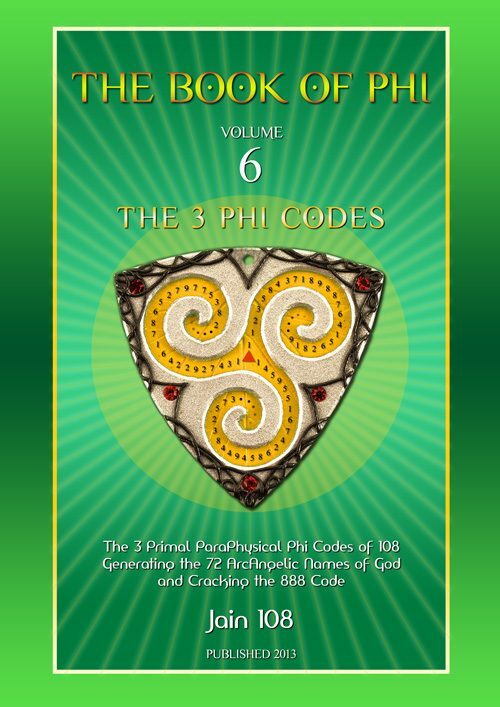 The 4 distinct topics that are presented will each become their own DVD title. 2 of 5 – Vedic Mathematics: Rapid Mental Calculation. No more calculators. Increases your memory power. 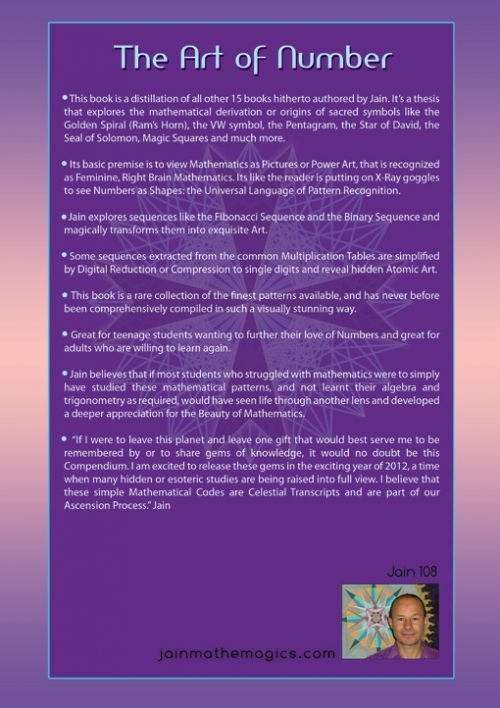 3 of 5 – Magic Squares: Translating Numbers into Atomic Art. Teaches Children the lost art of Pattern Recognition. 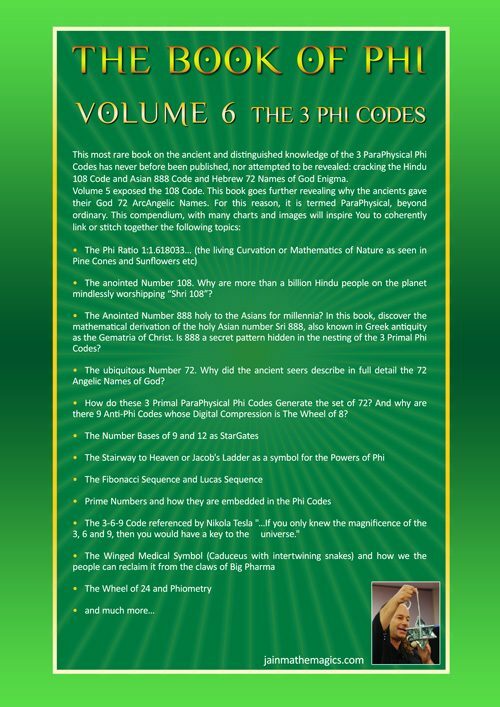 4 of 5 – The Divine Phi Proportion. Explores the Geometry of Flowers identical to the Human Canon! 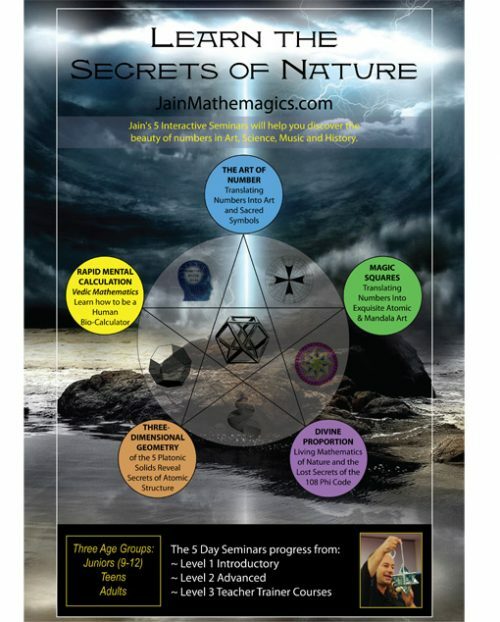 5 of 5 – 3-Dimensional Geometry. The Sacred Geometry of the 5 Platonic Solids adored by Pythagoras and his community.